The reason for all these things is because Gray has the ability, talent, stuff and repertoire to be a perennial Cy Young candidate. The pitcher Ortiz was talking about is the one who pitched to a 2.88 ERA over 491 innings in his first three seasons in the league and who shut out the Tigers over eight innings in Game 2 of the 2013 ALDS. That’s the pitcher the Yankees thought they were getting. That’s the pitcher I thought the Yankees were getting. The Yankees essentially did get that pitcher … when they were on the road. When Gray was away from Yankee Stadium, he was his usual self, but when the Yankees were home, it was like watching Game 7 of the 2004 ALCS every start. Despite his actual performances and lack of accountability for his performance, the Yankees continued to let him start every five days in June and July, thinking somehow he would get back on track. It wasn’t until the day after the trade deadline (which happened to be the year to the day the Yankees made the deal to acquire him) that the organization said enough was enough. In the middle of a three-game winning streak after finding out Aaron Judge would miss the majority of the remaining regular season, the Yankees had an afternoon game in the Bronx against the Orioles before going to Boston for a four-game series, which would decide the division. A win against the 23-59 Orioles would make the Yankees four games back of the Red Sox with a chance to erase the entire deficit over the coming weekend. Trey Mancini singled and Valencia scored. Caleb Joseph singled on a bunt. Renato Nunez doubled and Davis and Mancini scored. Tim Beckham singled and Joseph and Nunez scored. Adam Jones lined into a double play. Gray had given up a five runs in the second to a lineup featuring one player (Jones) who might start on any of the winning teams in the league and to a team who had recently traded away its best player in Manny Machado en route to a 115-loss season. Not only that, but it was a day game after a night game, and a day game after another loss for the the Orioles, who were going to have to fly to Texas after the game for a four-game series in the August Texas heat with 53 games left in their miserable season. In a must-have game and about as winnable of a game against about as a bad of opponent as there will ever be in Major League Baseball, Gray got absolutely rocked. The Yankees offense wasn’t out of the game yet, not against the Orioles pitching staff, but together, Gray and Aaron Boone pushed the game out of reach. Gray returned for the third inning, probably because Boone didn’t want to burn his bullpen ahead of the Boston series, but also possibly because Boone displayed an inability to know what he was doing when it came to bullpen management all season, ultimately ruining the ALDS for his team. After retiring the first two batters, Gray allowed a solo home run, followed by a walk and a single. Boone went out to take the ball from Gray and that game marked the end for Gray as a Yankee. Gray spent the last two months of the regular season in the bullpen, making just seven relief appearances and two spot starts over the final 56 games. He finished the season with 23 starts, only eight of which were “quality starts”. And in those 23 starts, seven times he allowed five or more earned runs and seven times he failed to pitch at least four innings. The Yankees went 11-12 when Gray started and 89-50 in all other games, winning 100 games despite Gray’s miserable season. He was left off the postseason roster, and the second the season ended, Brian Cashman went to work openly showing his displeasure in Gray’s performance and ending his Yankees tenure by saying things like “It hasn’t worked out thus far” and “I think that we’ll enter the winter, unfortunately, open-minded to a relocation” and “It’s probably best to try this somewhere else” and “Our intention is to move Sonny Gray and relocate him”. On Monday, Cashman finally traded Gray to the Reds for a prospect and a draft pick. What started back on July 31, 2017 as the Yankees getting two-and-a-half years of control for a potential ace at a bargain price for three players who might never reach or be regular players in the majors, ended with Gray pitching to a 4.51 ERA in 195 2/3 regular-season innings for the Yankees to go along with a loss and no-decision in two postseason starts. 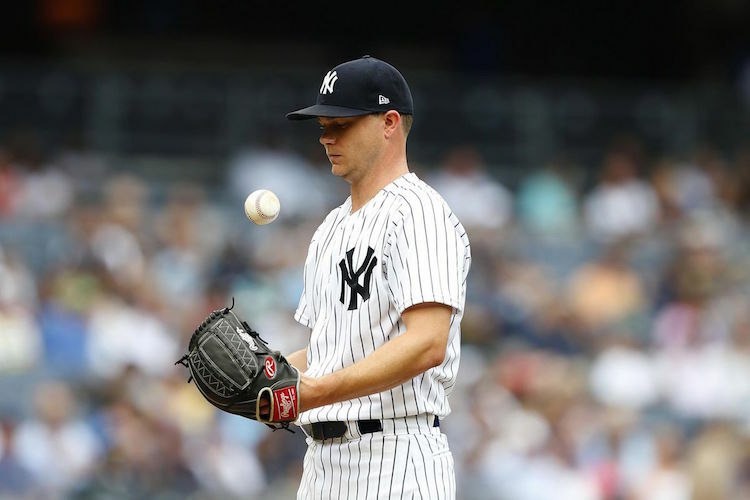 Sonny Gray’s tenure with the Yankees has ended. I’m happy it’s over.